Is there anything more comforting than baked pasta? If there is, I haven’t come across it yet. And while some pasta al forno dishes in the Italian repertoire—especially the two ‘star’ lasagne dishes, the South’s lasagna di carnevale and the North’s lasagne alla bolognese—are elaborate affairs, there are everyday versions that don’t require days in the kitchen. Here’s one that you can whip up practically at the spur of the moment. 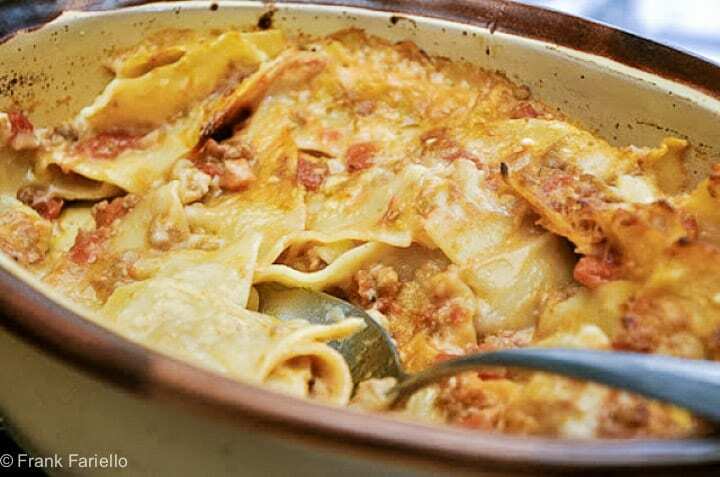 It is a simple mixture of parboiled store-bought pasta, meat sauce and béchamel, seasoned with some grated cheese and perhaps a bit of nutmeg, the baked in a hot oven until bubbly and bursting with flavor… Now, that’s my kind of eating. Cook the pasta in well salted water as you normally would, but drain the pasta while it is still slightly underdone. Pour the drained pasta into a large bowl, add the sugo di carne and mix well. Then add the bechamel sauce, grated cheese and nutmeg, gently folding it into the pasta and sauce. Do not attempt to make a smooth mixture out of it—just the opposite, you want interspersed ‘streaks’ of sauce and bechamel, which makes for a much more interesting dish. The mixture will be (and should be) rather loose—remember, the pasta will continue to absorb liquid as it bakes. If the mixture is a bit dry or sticky, add some liquid (milk or broth or just some water). Taste and adjust for seasoning; the mixture should be quite savory. Pour the contents of the bowl into a greased baking dish. Top with more grated cheese and a few pats of butter here and there. (Some people like to hold back some of the bechamel as well as a topping.) Bake in a hot oven (200°C/400°F) for about 20-30 minutes, until the top is nicely browned and the pasta is hot and bubbly. Let the dish rest at least 5 minutes before serving. You can use just about any store-bought pasta for a baked pasta dish, although short, tubular pastas like penne or rigatoni are probably the most commonly used. This time, though, I used some store-bought lasagnette, which I broke into short lengths, and it was delicious. The portions here of the two sauces sauce are really just indicative; if you like your dish meatier, feel free to add more meat sauce, if you like it creamier, more béchamel and, as mentioned above, you can add more cheese if you like it cheesier. You can be creative with this dish if you like, adding one or two other ingredients that may strike your fancy, for example, cubes of mozzarella or provola to the mixture, or sliced and sautéed mushrooms, some cubed ham, peas, sliced hard-boiled eggs or even tiny meatballs. But do resist the tempation to add everything but the kitchen sink. As I’ve said before the Italian culinary aesthetic is mostly about balance, not extravagance. There are many versions of pasta al forno, many of which are vegetarian. A typical southern baked pasta dish is zitoni al forno con le polpettine, known among Italian-Americans as Baked Ziti, which we have featured here on Memorie di Angelina. Some Italian versions are very cheesy, a bit along the lines of American macaroni and cheese. But to mind, this version will always be the pasta al forno, the one to master first before trying anything else. Baked pasta is traditionally considered a primo or first course, but I suspect most people today would be happy to make it a meal in itself, perhaps followed by a green salad and a piece of fruit. That’s certain enough for me, even on a Sunday! Pour the drained pasta into a large bowl, add the sugo di carne and mix well. Then add the bechamel sauce, grated cheese and nutmeg, gently folding it into the pasta and sauce. Do not attempt to make a smooth mixture out of it—just the opposite, you want interspersed 'streaks' of sauce and bechamel, which makes for a much more interesting dish. The mixture will be (and should be) rather loose—remember, the pasta will continue to absorb liquid as it bakes. If the mixture is a bit dry or sticky, add some liquid (milk or broth or just some water). Taste and adjust for seasoning; the mixture should be quite savory. voilà un plat qui me plait beaucoup, avec du jambon, quelques lardons et une salade, c’est un plat complet délicieux :). Merci et bonne journée ! Wow, another great pasta dish! I love baked pasta with some greens on the side. And you’re right, there’s no leftovers at our house either! Hey Frank My Italian born grandmother used to make baked pasta frequently, and your recipe is the closest I have to Nona's! For the Bechemal I usually add additional butter to the finished product and some grated Romano cheese. That's just beautiful, Frank. Who needs anything else when such a dish is on the table? @Ciao Chow Linda: Couldn't agree more. @Ideericette: Grazie anche a te! The weather finally turned to Autumn here, and that means more baked food. I prefer the savory baked type food like this pasta. Franka this sounds so comforting and like the perfect meal for a cold rainy night. Meravigliosa la tua pasta al forno… mangerei la foto. Ciao!!! Che buona la pasta al forno, peccato che a casa mia non si fa spesso!!! Mi segno la tua ricetta e la farò presto! I'm with you Frank – This makes a comforting meal, but also a great company meal too. Thanks, guys! There really is nothing better than baked pasta, is there? And @PolaM: Ha! Why resist? It's comfort and luxury, isn't it? I usually tend towards cheesy – but I am looking at yours and dreaming of smooth creaminess? Mmmm there really is nothing like a great baked pasta dish and I am so glad the weather is getting cooler so I can make this! Absolutely wonderful – I'm with you ….there is something so comforting about pasta. Pasta or soup are two of my favorite comfort foods! What a wonderful baked pasta dish! I wouldn't need anything else to eat if I had this. YUMMY! Why are you doing this to me? Now I want to have pasta al forno! Nothing makes me happy like a good pasta al forno or lasagne and you are showing a wonderful one… I will have to concentrate to resist! I love baked pasta. Even though only my wife and I are at home now, I often bake a whole pound of pasta and put it in 2 or 4 smaller dishes to bake. Then I freeze the left overs. That way we get pleasure out of for a couple of months. As you said an Entree course for most tastes in the US. I love baked pasta dishes particularly for their make ahead convenience. It's wonderful. I also like baked pasta very much, in particular with meat sauce and bechamel, but during the last period we are trying also some different tastes with lasagna.